Have you ever attended a marriage ceremony? Yes, we bet most of you have not attended this kind of marriage. 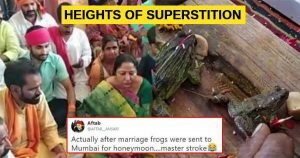 A minister in Madhya Pradesh attended a wedding and primarily has got a lot of attention from social media for his involvement in superstitious practices. What superstitious practices you ask, well the bride and groom were not human, but two frogs!. Yeah, you heard it right two frogs. You ask why, well apparently, According to ANI reports, two frogs were married off in order to please the rain, God. What came out to be more surprising is MP Minister Lalita Yadav attended the wedding. Surprisingly, not just one minister. But leaders of BJP organised a grand feast for the occasion. While we believe, our country has come along way from superstitions, stories like this proves otherwise. What is disturbing, not only people but the leaders as well took part in such ceremony. The amount of money spent on all this could have been used for providing water facility to farmers, and it would have helped a lot more than wasting money on such superstitious practices. The leaders of opposing party also commented on this unrealistic practice. Commenting about Yadav, Senior Congress leader from Chhattarpur Alok Chaturvedi said that instead of providing drinking water in the area Yadav was busy in organising such rituals. @narendramodi -frog marriage! is this your formula for attaining #Vikas? Is your party @BJP4India full of morons who are also office bearers? Shaming India nationally and internationally? Never thought Frog marriage for rain in MP could create this much impact in Mumbai. Can you divorce them to stop rain? It comes as a surprise and a shock that people are still believing in these of superstitious activity, and those who are supposed to be rational. Instead of stopping them, they joined the ceremony themselves.